How do you value a mining company? How do you know whether a share price is a good buy and leaves you some room for value increase? There are two main ways to value a company. Both end up at similar places and with similar values, but come from different angles. They are often used separately. Often people favor one over the other, and will dismiss the other method. This is unfortunate, as both have value.. 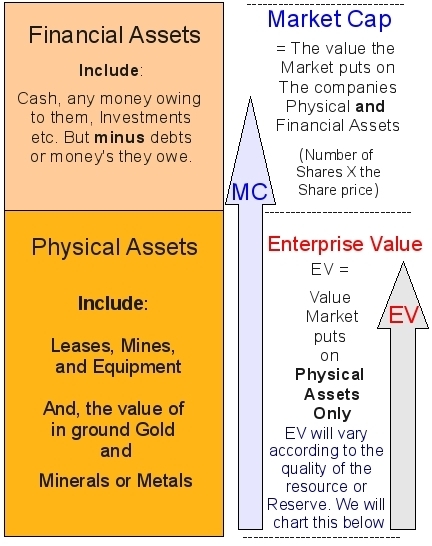 The first approach to valuing a company is by determining the Enterprise Value (EV) and dollar value you are paying per ounce of Resource held by that company. This is based on the quality and quantity of the reserves and resources held by the company. This page will deal with EV, and we will illustrate this with charts shortly, after a comment about net present value. Here is what Paul Van Eaden is quoted as saying about NPV. It goes without saying that he prefers this approach. 3 The value you are left with is the EV, as illustrated in the bottom right corner. 1. Take share price of the company you wish to evaluate. 2. Multiply the share price by the number of shares issued. And you are left with the enterprise value of the company set by the market. This is the amount you are paying in dollars per ounce of resource when you buy shares in a company. 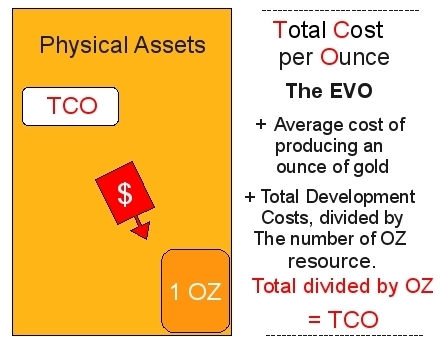 Simply divide the EV by the total ounces resource held by the company, and you are left with EVO. 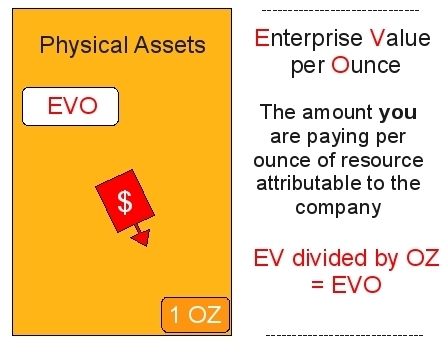 Use the company you used in your example above and Divide the EV by the resource ounces. This is a key part of your assessment. If your total cost per ounce is getting up to, or even above the price of gold, you may need to ask some serious questions. 2. Add the average cost of producing an ounce of gold. 3. Add the development costs per ounce. To get this cost, add all the development costs together and then divide the answer by the total number of ounces resource in the project. 4. Add 1,2 & 3 together and you will have a total cost per ounce. Using an EVO $12.55. and 1000,000 oz. Is the EVO & TCO a good deal? Draw a line across this chart, from left to right, at the percentage of a companies resource that is in the Reserve category. The point where you intersect the diagonal line between the yellow and blue gives you an indication of the quality of each ounce of resource. The further to the right that intersect point, the higher the EVO you can expect to pay. Of course, you need to balance this out with TCO. TCO will be impacted by grades, locations, and other factors. If a company has a large amount of their resource in the measured category, but has a very high cost of production, you should expect to pay less. Take the Example of RAU on that chart: With a resource of, say, 1000,000 oz, allows us to draw a line across well over the 75% point. If you look at the chart below, I have placed a blue dot, as the position a resource of that size. 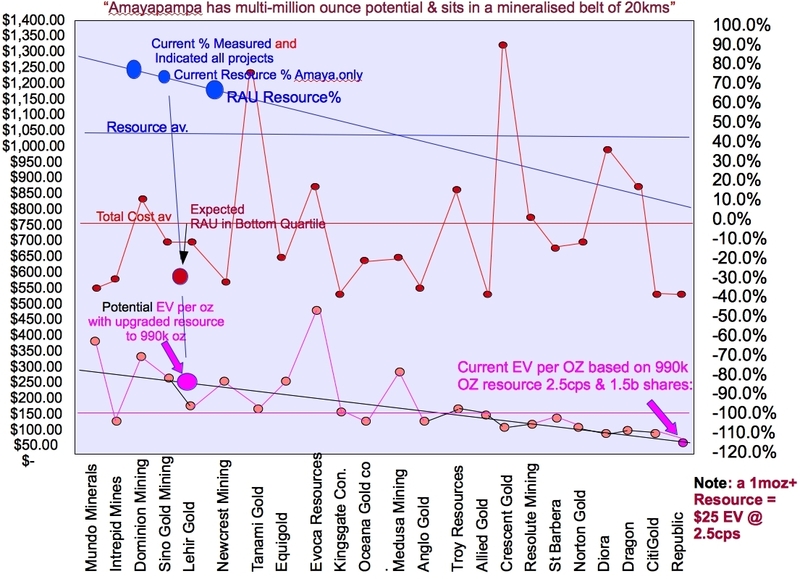 The pink line illustrates the EVO, or Enterprise Value and cost per ounce for these companies. Notice they go down in value from left to right. The center, red line, is the TCO. Here again on the far right you will see RAU. This is only an estimated TCO, based on the view that production costs would be in the lower quartile. Why is RAU’s “pink dot” (EVo) at the bottom right, while the “blue dot” (Percentage of higher category resource) is center or even far left? This point alone, suggests RAU has been way oversold, and that it remains very undervalued. This is where being able to work out Net Present Value is useful. NPV is much more dependent on knowing grades, throughput, and gold prices. Hopefully you will have noticed by now that working out Enterprise Value, and Enterprise Value per Ounce does not require information about gold prices, or even grades. 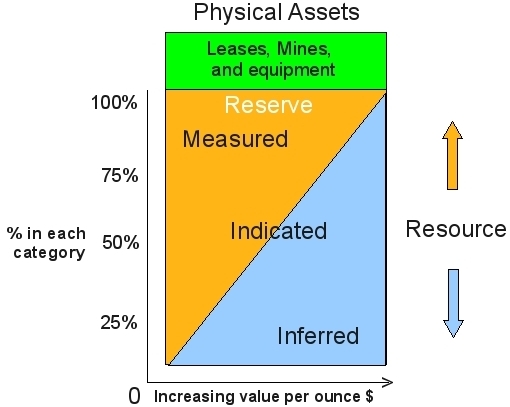 It focuses on Reserves, Resources and their category etc.